..... Click the link for more information. , and the recurrent phases of the moon. The earth completes its orbit about the sun in 365 days 5 hr 48 min 46 sec—the length of the solar year. The moon passes through its phases in about 29 1-2 days; therefore, 12 lunar months (called a lunar year) amount to more than 354 days 8 hr 48 min. The discrepancy between the years is inescapable, and one of the major problems since early days has been to reconcile and harmonize solar and lunar reckonings. Some peoples have simply recorded time by the lunar cycle, but, as skill in calculation developed, the prevailing calculations generally came to depend upon a combination. The fact that months and years cannot be divided exactly by days and that the years cannot be easily divided into months has led to the device of intercalation (i.e., the insertion of extra days or months into a calendar to make it more accurate). The simplest form of this is shown in ancient calendars which have series of months alternating between 30 and 29 days, thus arriving at mean months of 29 1-2 days each. Similarly four years of about 365 1-4 days each can be approximated by taking three years of 365 days and a fourth year of 366. This fourth year with its intercalary day is the leap year. If calculations are by the lunar cycle, the surplus of the solar over the lunar year (365 over 354) can be somewhat rectified by adding an intercalary month of 33 days every three years. Reckoning of day and year was considered necessary by many ancient peoples to determine sacred days, to arrange plans for the future, and to keep some intelligible record of the past. There were, therefore, various efforts to reconcile the count in solar, lunar, and semilunar calendars, from the Egyptians and the Greeks to the Chinese and the Maya. The prevailing modern method of constructing a calendar in the Christian West came originally from the Egyptians, who worked out a formula for the solar year (12 months of 30 days each, five extra days a year, and an extra day every four years) that was to be adopted later by the Romans. In its most primitive form the Roman calendar apparently had 10 months, which were (to use corresponding English terms whenever possible): March (31 days), April (29 days), May (31 days), June (29 days), Quintilis (31 days), Sextilis (29 days), September (29 days), October (31 days), November (29 days), and December (29 days). To fill out the 365 days a number of blank days or occasional intercalary months were used. Later, January (29 days) and February (28 days) were added at the end of the year. , highest priest of Roman religion and official head of the college of pontifices. As the chief administrator of religious affairs he regulated the conduct of religious ceremonies, consecrated temples and other holy places, and controlled the calendar. ..... Click the link for more information. was given the power soon after 200 B.C. to regulate the calendar, and the practice grew of using the intercalations for the promotion of political ends to lengthen or to shorten an official's term. When Julius Caesar became pontifex maximus, the Roman calendar had been so much abused that January was falling in autumn. At this point the methods of the Egyptian calendar were borrowed for the Roman. Julius Caesar, on the advice of the astronomer Sosigenes, added 90 days to the year 46 B.C. (67 days between November and December, 23 at the end of February). This caused the spring of 45 B.C. to begin in March. To retain this position of the seasons, he changed the length of most of the months: March, May, Quintilis (later named July after Julius Caesar), and October he left as they were; he added 2 days each to January and Sextilis (later named August to honor the Emperor Augustus); February was 28 days long except that in every fourth year a day was inserted between the 23d and the 24th of the month. In Roman computation three days in the month were used for counting the date. These three were the Kalends (1st day of the month), the Nones (the 7th day in March, May, July, and October, the 5th in the other months), and the Ides (the 15th day in March, May, July, and October, the 13th in the other months). The days were counted before, not after, the Kalends, Nones, and Ides. Thus, Jan. 10 was the fourth day before the Ides of January or the fourth day of the Ides of January, because the Romans counted inclusively. Jan. 25 was the eighth of the Kalends of February, Feb. 3 was the third of the Nones of February. Feb. 23 was the seventh of the Kalends of March and remained so when an intercalary day was inserted every fourth year between it and Feb. 24; hence in a leap year there were two days counted as the sixth of the Kalends of March. The leap year was therefore called bissextile [Lat.,=sixth twice]. There is a legend that alterations in the length of the months were made later by Augustus to flatter his own vanity, but there seems to be no foundation for this story. The Julian year is 365 days 6 hr, hence a little too long. Therefore, by the 16th cent. the accumulation of surplus time had displaced the vernal equinox to Mar. 11 from Mar. 21, the date set in the 4th cent. In 1582 Pope Gregory XIII rectified this error. He suppressed 10 days in the year 1582 and ordained that thereafter the years ending in hundreds should not be leap years unless they were divisible by 400. The year 1600 was a leap year under both systems, but 1700, 1800, and 1900 were leap years only in the unreformed calendar. The reform was accepted, immediately in most Roman Catholic countries, more gradually in Protestant countries, and in the Eastern Church the Julian calendar was retained into the 20th cent. The present generally accepted calendar is therefore called Gregorian, though it is only a slight modification of the Julian. The reform was not accepted in England and the British colonies in America until 1752. By that date the English calendar was 11 days different from that of continental Europe. For the intervening period before the reform was introduced into the English calendar, the Gregorian style is called the New Style (N.S. ), and the Julian the Old Style (O.S.). New Style years begin Jan. 1, but Old Style years began usually Mar. 25. Thus Washington's birthday, which is Feb. 22, 1732 (N.S. ), was Feb. 11, 1731 (O.S.). To avoid confusion sometimes both styles are given; thus 11 Feb. 1731/22 Feb. 1732.
period of time shorter than the month, commonly seven days. The ancient Egyptians used a 10-day period, as did the French under the short-lived French Revolutionary calendar. ..... Click the link for more information. , should fall on a Sunday. The Bible places the Passion with relation to the Passover. Since the Jewish Passover is on the evening of the 14th (eve of the 15th) Nisan (see below), it may fall on any day of the week; hence Easter must fall on a Sunday near the 14th Nisan. In ancient times some Eastern Christians celebrated Easter on the 14th Nisan itself; these were called Quartodecimans [Lat.,=fourteenth]. In 325 the First Council of Nicaea determined that Easter should fall on the Sunday following the next full moon after the vernal equinox, the full moon being theoretically the 14th day, and Nisan beginning with a new moon in March. The vernal equinox was considered by the church to fall on Mar. 21. The paschal, or Easter, moon is the full moon, the 14th day of which falls after (but not on) Mar. 21. Today Easter is calculated according to a system that does not take all factors of the lunar period into consideration, and it nearly always varies somewhat from what it should be according to true astronomical calculation. Several different systems have been used for determining Easter. In the 6th and 7th cent. in England, there was a great dispute between Christians who derived their rite from the Celts and Christians who had been converted as a result of the mission of St. Augustine. The dispute was settled at the Synod of Whitby in favor of the Roman system, which prevailed from that time over the entire West. For a conventional means of computing Easter, see the Anglican Book of Common Prayer. The Jewish calendar is today a lunisolar or semilunar calendar, i.e., an adjustment of a lunar calendar to the solar year. The months are Tishri (30), Heshvan—sometimes also called Marheshvan—(29 or 30), Kislev (29 or 30), Tebet (29), Sebat or Shebat (30), Adar (29), Nisan (30), Iyar (29), Sivan (30), Tammuz (29), Ab (30), and Elul (29). The intercalary month of 30 days, Adar II, is added after Adar, Nisan being in ancient times the first month. The intercalation is arranged to take place seven times in 19 years; this is called the Metonic cycle after the Greek astronomer Meton who proposed it about 432 B.C. to express the relation between a lunar and solar year. The common year is referred to as a defective, regular, or perfect year, depending upon whether its length is 353, 354, or 355 days; the leap year may have 383 (defective), 384 (regular), or 385 (perfect) days. The Jewish civil year begins about the autumnal equinox, with the festival of Rosh ha-Shanah (the first of Tishri), which in 1999 fell on Sept. 11, marking the start of the Jewish year 5760. [Ar.,=Hijra=breaking off of relations], the departure of the prophet Muhammad from Mecca in Sept., 622. Muhammad was a monotheist and preached against the polytheism of the Meccan religion. ..... Click the link for more information. ] is used to indicate the Islamic year). Muharram 1, A.H. 1420 was Apr. 17, 1999.
, Indian people dominating central Mexico at the time of the Spanish conquest. Their language belonged to the Nahuatlan subfamily of Uto-Aztecan languages. They arrived in the Valley of Mexico from the north toward the end of the 12th cent. the official calendar of France, Nov. 24, 1793–Dec. 31, 1805. Its introduction was decreed by the Convention on Oct. 5, 1793, but it was computed from Sept. 22, 1792, the autumnal equinox and the day after the proclamation of the republic. period of historic time. In geology, it is the name applied to large divisions of geological process, e.g., Paleozoic era (see geology). In chronology an era is a period reckoned from a fixed point in time, as before or after the birth of Christ—before Christ, B.C. ..... Click the link for more information. . The adoption of such era systems has made computation of time much easier. See P. W. Wilson, The Romance of the Calendar (1937); H. Watkins, Time Counts: The Story of the Calendar (1954); K. G. Irwin, The Three Hundred Sixty-Five Days (1963); J. E. S. Thompson, Mayan Hieroglyphic Writing (3d ed. 1971); F. Parise, ed., The Book of Calendars (1982). Any of various present-day, past, or proposed systems for the reckoning of time over extended periods: days are grouped into various periods that are suitable for regulating civil life, fixing religious observances, and meeting scientific needs. All calendars are based either on the motion of the Sun (solar calendar), or of the Moon (lunar calendar), or both (lunisolar calendar) so that the length of the year corresponds approximately to either the tropical (solar) year or the lunar year. Their complexity results primarily from the incommensurability of the natural periods of day, month, and year: the month is not a simple fraction of the year and the day is not a simple fraction of the month or the year. Present-day calendars include the Gregorian calendar, which is in use throughout most of the world, and the Moslem, Jewish, and Chinese calendars. A sculptured or painted emblematic series depicting the months of the year, often including the signs and symbols of the zodiac. 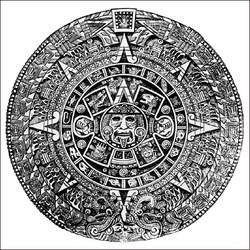 The famous Aztec calendar can be read in terms of cycles covering thousands of years. Reproduced by permission of Fortean Picture Library. Astrology is built upon an accurate accounting of time. Fundamental to this accounting is a calendrical system that takes into consideration the irregular manner in which days, months, and years fit together. A calendar in the broadest sense consists of the set of rules that a society uses for deciding which days are ordinary days and which are holidays (a variant of “holy days”). Societies in the past evolved many different kinds of calendars, and a surprisingly large number of them are important for understanding the details of the Western civil calendar. There are three natural divisions of time on Earth. The most obvious is the alternation of night and day, and all calendars are organized in terms of the 24-hour day, which is the approximate average length. However, not all calendars are organized in terms of hours with a fixed length. Our ability to measure seconds and even minutes accurately was achieved only in modern times. A medieval sundial divided the hours of sunlight into 12 hours, but, obviously, in northern latitudes an hour during a long summer day might be twice as long as an hour during a short winter day. The Western civil calendar that is now used internationally is based on hours of a precisely defined fixed length, but there are still some local or folk calendars in which the length of an hour is much more flexible. The next most obvious way to divide time is to use the phases of the Moon. Originally, a month was a “moonth”: It represented the period from one full moon or new moon to the next. We cannot know how people measured time during the tens or hundreds of millennia that all human beings existed as bands of hunters and gatherers, following the herds and the ripening fruits and grains in an annual migration north and south. During the last ice age (from roughly 20,000 to 100,000 years ago), when human beings were forced to live in caves and develop new stoneware technology in order to survive, they may have begun tallying the phases of the Moon more carefully than before in attempting to calculate the length of the lunar month. In the Western civil calendar, months are arbitrary groups of days, ranging from 28 to 31 days in length that are not correlated with the phases of the moon. All major religious calendars (Christian, Jewish, Moslem, Buddhist, and Hindu) still depend wholly or partly on having months that are exactly in phase with the Moon. The third most obvious time division is marked by the seasons—the annual migration north and south of the Sun’s rising and setting points. Probably for a long time, years were labeled only relatively, as the regnal year of a king, by the number of years since some memorable event, and so on; and this starting point would be changed with every new generation. Only rather late in the history of civilization did years begin to be numbered from some fixed point in the distant past, such as the first Olympiad, the founding of the city of Rome, or the birth of Jesus of Nazareth. Being used to our modern answers to these questions, we may think them obvious; but they are not, and adequate answers to them were found only by centuries of ongoing observations, measurements, and calculations. The technique of dividing day and night into 12 hours each was devised by the Babylonians, who calculated with a number system that used a base of 12 rather than 10. Hours were introduced into the Roman calendar only rather late in Roman history, when the seven-day week (also a Babylonian invention) was generally adopted. Originally the Romans had divided day and night into watches, each several hours in length. In modern usage, a day is defined as being 24 hours long; an hour is defined as 60 minutes, or 3,600 seconds, long; and a second is defined as so many vibrations of a specific line in the spectrum of a specific isotope. Naturally, this definition was worked out in a way that makes 24 hours equal to the traditional average length of a day. It was finding this average length that was the problem in the ancient world, for several reasons. First, where do you measure from? The convention of starting each calendar day at midnight was agreed upon only in modern times. In most ancient calendars, each day began at sunset and ended at the following sunset (some ancient peoples, such as the Egyptians, counted a day as running from one dawn to the next); this is why the “eve” before many traditional holidays is still important and why the Jewish Sabbath celebration begins at sunset on Friday. But exactly when is sunset? It takes about 15 minutes for the Sun to sink completely below the horizon, which appears higher on land than it does at sea. This ambiguity is why the Talmud prescribed that all activities not allowed on the Sabbath should cease two hours before sunset. Some conventional definition—such as measuring from the moment the disc of the sun first touches the horizon—had to be introduced and adhered to. Furthermore, since the days (in the sense of hours of light) grow longer (how much longer depends on the latitude) during half the year, shorter during the other half, an accurate measurement needs to be correct to within less than a minute to be useful for constructing a calendar. But there were no accurate techniques before modern times—even measuring a quarter hour accurately was difficult—and so the ancient calendars tended to accumulate an error of a day every few years. In most ancient calendars, a month was a lunar month, that is, one full cycle of the Moon’s phases. We know now that the average length of a lunar month, measured from one astronomical new moon to the next, is 29.5306 days. However, an ancient month began not at the astronomical new moon, which is an invisible event, but at the first visible crescent. Many factors affect when the crescent of the new moon will be visible at a particular location. Usually the interval from each first crescent to the next will alternate between 29 and 30 days—and so the length of the months will alternate likewise—but it is easily possible for two or even three intervals of 29 days or 30 days to fall successively. Hence, it was quite late in history—long after the length of the year was well known—before the average length of the lunar cycle was known with usable accuracy. We know now that the average length of the year is 365.2422 days, but this precise value was taken into account only by the Gregorian reform of the calendar in 1582. The Julian calendar (devised by Julius Caesar), which the Gregorian calendar replaced, assumed the year to be 365.25 days long (as we all do for ordinary purposes), and the earlier Roman calendar that Julius replaced apparently assumed the year to be 366.25 days. The Egyptian calendar, which Julius borrowed as the basis for his, assumed the year to be exactly 365 days. The problem in the ancient world again was finding a fixed point from which to measure the length of (or to begin) the year. The most popular choices were the winter solstice, when the days begin growing longer again, and the spring equinox, when the hours of sunlight and darkness are equal, but many others were also used. Measuring the moment of winter solstice would seem a difficult task for ancient peoples, but it now seems clear that the people who built Stonehenge about 3000 b.c.e. could do so quite accurately. They could also predict all eclipses of the Sun and the Moon. The Egyptians seem to have solved the problem by observing the heliacal rising of Sirius each year: The fixed stars, including Sirius, appear to rotate about the Earth each sidereal day, which is always the same length. Which stars are visible in the night sky depends on where the Earth is in its annual orbit around the Sun. Sirius (and any other star) will always first become visible after sunset (weather and local conditions allowing) on the same day each year relative to the solstices and equinoxes; this is its heliacal rising. In classical times, the Mesopotamians claimed that they had also solved the problem in another way, as early as the Egyptians had, but it is not certain that they had done so before the seventh century b.c.e. This is the most difficult of the four questions (and the one that causes the most differences between calendars), because the length of the solar year is not a simple multiple of the length of the lunar month. Hence, if the months are to stay in phase with the Moon, there are many problems. Twelve months that alternate between 29 and 30 days produce a year of 29.5 x 12 = 354 days, which is 11.2422 days short of an average solar year. Every three years this difference will add up to 33.7266 days, allowing an extra lunar month—of, say, 30 days—to be added. This still leaves a difference of 3.7266 days, which will add up to 33+ days after 27 years, allowing an extra lunar month to be inserted, and so on. It seems clear, however, that people generally would not like to have a feature in their calendars that appears only once in 27 years; for example, what would this extra month be called? Would it contain any holidays? Only two basic kinds of calendars have succeeded in dealing adequately with the various problems of timekeeping: (1) the lunisolar calendar of the Mesopotamians, which added lunar months during years three, five, and eight of eight-year cycles, and (2) the purely solar calendar, devised by the Egyptians. Despite the retention of 30-to 31-day periods that are still termed months, the Western calendar is a solar calendar. The zodiac bears the imprint of all three means (days, months, and years), of measuring time, but does not correspond precisely with any of them. The astrological year and the solar year, for example, are of equal lengths, but the astrological year begins at the exact moment the Sun enters the sign Aries (the spring equinox) rather than on January 1. Also, the Sun resides in each sign for approximately one month, but neither the lunar months (which vary every year) nor the months of the Western calendar correspond with this residence (the Sun enters each sign between the eighteenth and the twenty-fourth of each month). For these reasons and others, astrologers must use their own calendars, termed ephemerides, to determine the precise positions of the heavenly bodies. Colson, F. H. The Week. Cambridge: Cambridge University Press, 1926. Hawkins, Gerald S. Stonehenge Decoded. New York: Doubleday, 1965. Hoyle, Sir Fred. Stonehenge. San Francisco: W. H. Freeman, 1976. Nilsson, Martin P. Primitive Time-Reckoning: A Study in the Origins and First Development of the Art of Counting Time Among the Primitive and Early Culture Peoples. Lund, Norway: Gleerup, 1920. O’Neil, W. M. Time and the Calendars. Sydney: Sydney University Press, 1975. Parise, Frank, ed. The Book of Calendars. New York: Facts on File, 1982. Wilson, P. W. The Romance of the Calendar. New York: Norton, 1937. Wright, Lawrence. Clockwork Man: The Story of Time, Its Origins, Its Uses, Its Tyranny. New York: Horizon, 1968. (from the Latin calendarium, meaning account book; such books showed the first day of each month, the calen-dae, on which debtors in ancient Rome paid interest), the system of reckoning prolonged intervals of time based on the periodic phenomena of nature related to the movements of celestial bodies. The development of the calendar reflects the conditions of the economic way of life of various peoples. Astronomical foundations. The calendar reflects astronomical phenomena: the alternation of day and night, the change of lunar phases, and the alternation of seasons. The units of measurement for long intervals of time are established on the basis of these phenomena: the mean solar day (24 hours), the synodic month (29 days, 12 hours, 44 minutes, and 3 seconds of mean solar time), and the tropical year (365 days, 5 hours, 48 minutes, and 46 seconds of mean solar time). It is not possible to select an integral number of tropical years that would contain an integral number of synodic months and an integral number of mean solar days; these three magnitudes are incommensurable. This explains the difficulty in constructing calendars and the appearance, over several millennia, of numerous calendar systems that have attempted to overcome these difficulties. Attempts to coordinate the day, month, and year have led different peoples at different times to create three types of calendars: lunar calendars, based on the movements of the moon and constructed for the purpose of coordinating the course of the day and the lunar month; lunisolar calendars, which represent attempts to coordinate all three units of time; and solar calendars, in which the day and the year are approximately coordinated. Lunar calendars. In the lunar calendar the year is divided into 12 months, each of which alternately has 30 or 29 days. The lunar year has a total of 354 days. In order for the first day of each year to fall on a new moon (this is one of the requirements of the lunar calendar), additional days are added to the last month in certain years; the years having 355 days are leap years. Because the lunar calendar is shorter than the solar calendar by about 11 days, each year the beginning of the lunar year shifts to an earlier time and may fall in any month of the solar year. Thus, in 1973 the beginnning of the lunar year falls on February 4, while in 1974 it falls on January 25; in 1975, on January 14; in 1976, on January 3 and December 23; in 1977, on December 12; in 1978, on December 2; in 1979, on November 21; in 1980, on November 9; and so on. The seven-day week coincides by days with the days of the week in the solar calendar. The lunar calendar has become common in the Islamic countries, where it is called the Hegira (or hijra). The starting point of the chronology in this calendar is July 16, A.D. 622. At the present time lunar calendars are used in Algeria, Iraq, Kuwait, Lebanon, Libya, Mauritania, Morocco, Nigeria, Saudi Arabia, Syria, Somalia, Sudan, Tunisia, and a number of other countries. Lunisolar calendars. Lunisolar calendars are the most complex because they coordinate the movement of the sun with the alternation of lunar phases. Lunisolar calendars are based on the ratio of 19 solar years to 235 lunar months (with an error of less than 1.5 hours). In the course of each 19 years, 12 years have 12 lunar months (of 29-30 days) and seven years have 13 lunar months. Additional months are added in the third, sixth, eighth, 11th, 14th, 17th, and 19th years of the 19-year cycle. In antiquity lunisolar calendar systems were used in Babylonia, China, Judea, Greece, Rome, and other countries. In the 20th century a lunisolar calendar is the official calendar in Israel, where the beginning of the year falls on one of the days between September 5 and October 5. In a number of Far Eastern countries (Vietnam, China, Korea, Mongolia, Japan), an unofficial 60-year cyclical calendar is used in everyday life in which the start of the year falls on one of the days between January 20 and February 20. Solar calendars. One of the first solar calendars, the Egyptian calendar, was created in the fourth millennium B.C. The calendar consisted of 365 days and was divided into 12 months of 30 days each; five holidays not included in the months were added at the end of the year. Among the solar calendars are the Julian, the Gregorian, the French Republican calendar, the unified national calendar of India, and the proposed World calendar. At the present time the international calendar is the Gregorian calendar. JULIAN CALENDAR. The modern calendar traces its origins to the ancient Roman solar calendar, which was introduced on Jan. 1, 45 B.C., as a result of a reform carried out in 46 B.C. by Julius Caesar (from whom the name is taken). January 1 also became the beginning of the new year (before this the new year in the Roman calendar had begun on March 1). The average length of the year in the Julian calendar was set equal to 365 1/4 days, which corresponded to the length of the tropical year known at that time. For convenience, three consecutive years numbered 365 days each and the fourth, the leap year, numbered 366. The year was divided into 12 months, for which the ancient names were preserved: Januarius, Februarius, Martius, Aprilis, Maius, Junius, Quintilis, Sextilis, September, October, November, and December. The number of days in the months was organized so that all odd-numbered months had 31 days and all evennumbered months, 30. Only February in the common year had 29 days. In 44 B.C. the month of Quintilis (the fifth month) was renamed Julius in honor of Julius Caesar, and in 8 B.C. the month of Sextilis (the sixth month) was renamed Augustus in honor of the Roman emperor Augustus. in addition, the alternation of long and short months was changed: one day was added to August at the expense of February and at the same time one day was shifted from September to October and one day from November to December. the correct use of the Julian calendar began in A.D. 7; from this time, all years of the Julian calendar whose ordinal number is divisible by 4 are leap years. In A.D. 325, at the Council of Nicaea, the Julian calendar was adopted by the Christian Church. GREGORIAN CALENDAR. Because the length of the Julian year was 11 minutes and 14 seconds greater than the tropical year, an error of one day accumulated each 128 years. Therefore, the vernal equinox, which had fallen on March 21 in A.D. 325 fell on March 11 at the end of the 16th century. the error was corrected in 1582 when a reform of the Julian calendar was proclaimed by a bull of Pope Gregory XIII. The correction lay in moving the sequence of ten days ahead, and it was ordered that the day after Thursday October 4 be considered Friday, but October 15, not October 5. In this way the vernal equinox was again returned to March 21. In order to prevent new errors, it was decided to discard three days every 400 years. In this way, instead of the 100 leap-year days each 400 years in the Julian calendar, the new calendar had only 97. Excluded from the group of leap years were the century years (years with two zeros on the end) whose number was not divisible by 4 without a remainder, specifically, 1700, 1800, and 1900. The corrected calendar was called the Gregorian calendar, or the New Style (distinguished from the Julian, which was called the Old Style). the average length of the year in this calendar is just 26 seconds more than the length of the tropical year, which results in an error of only one day in 3, 280 years. The difference between the Old and New styles totals 11 days in the 18th century, 12 days in the 19th century, and 13 days in the 20th century. The Gregorian calendar was introduced in different countries at different times. In the 1580’s it was introduced in Italy, Spain, Portugal, Poland, France, Luxembourg, the southern Netherlands, Bavaria, Austria, the Catholic cantons of Switzerland, and Hungary. In other countries it began to be used in the early 17th century (Prussia), at the end of the 17th century (the Protestant part of Germany, Norway, and Denmark), in the 18th century (northern Netherlands, Great Britain, Sweden, and Finland), in the 19th century (Japan), and in the 20th century (China, Bulgaria, Rumania, Greece, Turkey, and Egypt). In Russia the Gregorian calendar was introduced after the Great October Socialist Revolution by a decree of the Council of People’s Commissars of the RSFSR on Jan. 24, 1918 (published on Jan. 25 and 26, 1918). According to this decree a correction of 13 days was introduced and the day after Jan. 31, 1918, was considered to be February 14, not February 1. The days of the week of both calendars coincide and therefore the day of the week is preserved during the transfer from one to the other. Thus, Apr. 10, 1870, Old Style, and Apr. 22, 1870, New Style, both fall on Friday. By the mid-20th century the Gregorian calendar was used by virtually all countries of the world. ANCIENT RUSSIAN CALENDAR. The ancient Slavs divided the year into 12 months whose names were closely related to observed natural phenomena. At the same time, depending on local climate, the same months received different names in different regions. The most firmly established names were sechen (January), wood cutting time; liutyi (February), time of bitter cold weather; berezozol (March), which has several interpretations: the beginning of birch blooming, tapping of birch trees, or burning birch wood for charcoal; tsveten’ (April), time when orchards bloom; traven ’ (May), time when grass becomes green; cherven’ (June), time when cherries ripen; lipets (July), time when linden trees bloom; serpen’ (August), from the Russian word for sickle, harvest time; veresen ’ (September), time when heather blooms; listopad (October), time when leaves fall from trees; gruden’ (November), from the Russian word gruda meaning a frozen wheel rut in a road; and studen’ (December), which means chilly or cold. Many ancient Slavic names of months later passed into numerous Slavic languages and have been preserved to a significant degree in certain modern languages (in particular, Ukrainian, Byelorussian, and Polish). FRENCH REPUBLICAN CALENDAR. The French Republican calendar was introduced by a decree of the National Convention dated oct. 5, 1793. sept. 22, 1792, the day the king was overthrown and the Republic was proclaimed, which in this year coincided with the autumnal equinox, was adopted as the beginning of the chronology. The year was divided into 12 months of 30 days each. The names of the months reflected phenomena ofnature and the meteorological and agricultural conditions of the climatic zone of France. To reconcile the length of the calendar and tropical years, five more days were added at the end of each year and six days in leap years. Instead of the seven-day week, the month was divided into three ten-day periods. On Jan. 1, 1806, the Republican calendar was replaced by the Gregoriancalendar. WORLD CALENDAR. The Gregorian calendar has a number of shortcomings: the months are of unequal length (28, 29, 30, and 31 days), the quarter years are unequal (90, 91, or 92 days), the half-years are unequal (181, 182, or 184 days), and there is no regular correspondence between dates and days of the week. Therefore, as far back as the 19th century the question of reforming the calendar began to be discussed, that is, introducing a calendar that would not have the aforementioned shortcomings of the current calendar. Many plans for a new calendar were worked out in different countries. For example, one of them suggested that the calendar year contain 364 days (four quarter years of 91 days each and 13 full weeks in a quarter year), with each date always falling on the same day of the week. To coordinate it with the tropical year, one extra day must be added at the end of each year (World Day or Peace Day) and once every four years a second extra day must be added after June 30 (Leap-year Day). However, the developed political and economic relations existing between the countries of the world make it possible to carry out calendar reform on a multinational scale only. The Economic and Social Council of the United Nations is studying the problem of calendar reform. Idel’son, N. I. Istoriia kalendaria. Leningrad, 1925. Idel’son, N. I. “KalendarV In BoVshaia Sovetskaia Entsiklopediia, 2nd ed., vol 19. Moscow, 1953. Siuziumov, M. Ia. “KalendarV In Sovetskaia istoricheskaia entsiklopediia, vol. 6, Moscow, 1965. Tsybul’skii, V. V. Sovremennye kalendari stran Blizhnego i Srednego Vostoka. Moscow, 1964. Ginzel, F. K. Handbuch der mathematischen und technischen Chronolo-gie, vols. 1-3. Leipzig, 1906-14.
a printed table or booklet giving months and dates, days of the week, holidays, and often astronomical information. Among the various kinds of calendars are tabular calendars, consisting of a table listing the days of the year; turnover calendars, whose sheets are turned on a special holder; tear-off calendars; table calendars, books giving detailed descriptions of anniversaries, important dates, and other information; business calendars for writing memorandums; and calendars with colored illustrations. The last category includes calendars bound in book or album form and wall calendars, which have an advertising or gift-presentation format and consist of a series of monthly tables with reproductions, decorative drawings, or color photographs. In ancient Rome the term “calendar” was first used to designate books in which creditors recorded the interest that was paid monthly on the calends (hence the name). Later the word came to be applied to the books listing religious holidays, the birthdays of emperors, and the days of Senate meetings. The oldest Roman calendar that has come down to us dates from A.D. 354. There were many lists and compilations indicating holidays and giving legends of Christian saints, which were known as calendars, books of saints’ days, martyrologies, or Menaias. The Orthodox Slavs called their calendars mesiatseslovy (books of months). In the Middle Ages the publication of calendars was controlled by the church. Calendars with a secular content began to appear in the 14th century. In Kievan Rus’ the first attempt to specify what should or should not be done on certain days was undertaken in the Izbornik (collection) of Sviatoslav (1076). Western calendars began to appear in Russia in the 16th century, and Russian calendars modeled on them began to be produced, such as the Godovoi razpis\ Hi mesiachilo (Yearly Register, or Months) for 1670. After 1727 the St. Petersburg Academy of Sciences had the sole right to publish calendars. After 1770 calendars were called mesiatseslovy. They were printed in small editions (17, 000-18, 000 copies) and sold at extremely high prices. In the mid-19th century the mesiatseslovy contained much historical, astronomical, geographical, and meteorological information, as well as data on rail and ship transport. Private individuals began to publish calendars in 1865. One of the first private publishers of Russian calendars was the Czech A. A. Hatcuk. In the early 20th century, the publisher I. D. Sytin initiated the publication of cheap, colorful calendars for the mass market. His widely distributed table calendars, the All-Purpose Calendar and the Universal Russian Calendar, contained much useful information. The printings of Sytin’s table calendars reached the unprecedented figure of 6 million copies. Later, with the help of L. N. Tolstoy, Sytin arranged for the publication of a tear-off calendar with a printing of 8 million. At the same time other publishing houses were producing expensive calendars, such as G. Goppe’s The King of Bells: An Illustrated Calendar-Almanac and The Universal Calendar and A. S. Suvorin’s Russian Calendar. Special calendars were published for different professions (military men, jurists, beekeepers); there were calendars for children, calendars for women, and household-management calendars. From 1899 to 1915, P. N. Arian published the First Women’s Calendar. The Bolshevik publishing house Zerno issued a table calendar entitled the Calendar for Everyone for 1908, for which V. I. Lenin wrote his article “The International Socialist Congress in Stuttgart” in 1907. The first calendar published after the October Revolution and the change (February 1918) from the Julian to the Gregorian calendar was the Soviet Calendar, a table calendar for 1919, which was published by the Sytin printing plant for the All-Russian Central Executive Committee of the RSFSR. Later, tear-off and turnover calendars were issued, as well as such table calendars as the Universal Table Calendar, the Worker’s Table Calendar, the Peasant’s Calendar, and Red Village. The most widely used and popular calendars in the USSR are issued by Politizdat. These include general tear-off calendars with editions of about 16 million copies, the Calendar for Women (14 million copies), the Calendar for Schoolchildren (2.5 million copies), the Table Calendar, and the illustrated calendars Motherland, In the World of Beauty, Women’s Calendar, Calendar for Youth, and Sport. Politizdat also issued the special illustrated Lenin Calendar commemorating the 100th anniversary of Lenin’s birth, and the Karl Marx Calendar, in honor of the 150th anniversary of Marx’ birth. In 1972, Politizdat printed a total of 40 million calendars. Other central publishing houses of the USSR issue the Soldier’s Calendar, the Rural Calendar, the Theater Calendar, the Cinema Calendar, In the World of Music, One Hundred Memorable Dates, Little Star (for October children’s groups), the Philatelist’s Calendar, and the Calendar of Important and Memorable Dates. Moreover, several Union and autonomous republics publish tear-off and table calendars in the languages of the peoples of the USSR. In foreign countries illustrated wall calendars in tabular form without texts are widely used. The reverse sides of the sheets oftear-off calendars usually bear messages, chiefly on religious and ethical themes. What does it mean when you dream about a calendar? Dreaming about a calendar can be the subconscious’s attempt to remind one of an important appointment or event. Alternatively, it could be about the passing of time. A system for everyday use in which time is divided into days and longer periods, such as weeks, months, and years, and a definite order for these periods and a correspondence between them are established. A sculptured or painted emblematic series of the months. Google Calendar offers two-way syncing with BlackBerry and can be used with other advanced cell phone and handheld devices. When the district moves Edison and Jefferson elementary schools back to a traditional calendar in September, only Columbus, Keppel, Mann and White elementary schools will remain on the year-round calendar. To create an additional calendar, go to your Folder List and right-click on Calendar, producing the screen at right. This wall calendar with vivid paintings feature the glory days of a majestic civilization. the results would show that an overwhelming majority of the community would agree to move forward with a calendar change. Botfa notes that the calendars sell for $7, which is less than the hefty $15 per calendar production costs. Several steps can be taken in order to capitalize on the opportunities that arise from the circumstance of the year-round school calendar in a community. Furthermore, the first phases of the industrial revolution revitalized the British calendar when the poor used the old customs of hospitality to supplement their uncertain incomes. As it moves out of beta, Zoho Calendar gains a number of features designed to support power users, including the ability to import, share and subscribe to data from other Zoho and third-party calendars. If we were lucky, the calendar producer used classic oil paintings and we got an aesthetic education as well as religious, getting our first taste of Carravaggio, Tintoretto, Fra Angelico, and Rafael. Mass-market calendar publishers and black presses are opening the floodgates of African American theme products this coming year.